1Department of Hematology, NilRatan Sarkar (NRS) Medical College & Hospital, Kolkata, India. 2Department of Nephrology, NilRatan Sarkar (NRS) Medical College & Hospital, Kolkata, India. Received: June 27, 2014; Revised: September 15, 2014; Accepted: January 27, 2015; Published online: March 24, 2015. TO THE EDITOR: Hemolytic uremic syndrome (HUS) is characterized by a triad of non-immune hemolytic micro-angiopathic anemia, thrombocytopenia, and acute renal failure . The majority of cases are "typical HUS," caused by an enteric infection of Shiga toxin-producing Escherichia coli. Rarely, however, HUS is caused by dysregulation of the alternative pathway of the complement system and is known as atypical HUS (aHUS). One rare subtype is caused by anti-complement factor H (CFH) antibodies. Such patients are commonly treated by nephrologists; however, they will usually present to a hematologist for variable cytopenias. We report here one such patient who presented to us primarily for cytopenias. A 9-year-old girl presented to our hematology clinic complaining of vomiting for 15 days and generalized weakness and back and neck pain of similar duration. She also complained of vague abdominal pain. She had no fever or diarrhea immediately preceding the episode. There was no history of significant past illness. Her growth and development was normal for her age. She was born out of non-consanguineous marriage with no perinatal complications. She has one older brother who is apparently normal. On examination, she had significant pallor and icterus, without cyanosis or edema. On admission, her blood pressure was 118/78 mmHg, pulse 98 beats/min, respiratory rate 26 breaths/min. Abdomen was soft, nontender with normal bowel sounds. Liver was 3 cm palpable; there was no splenomegaly, lymphadenopathy, or skin rash. A summary of her laboratory parameters at admission is shown in Table 1. A peripheral smear examination showed 20 NRBCs/100 WBCs, polychromasia, anisopoikilocytosis and microspherocytes with presence of fragmented cells (Fig. 1). Differential count was normal with no atypical cells found. She was diagnosed with a case of thrombotic microangiopathy. Plasma exchange therapy was started. The laboratory parameters started improving after 1 day (Fig. 2). She responded to the therapy and her vomiting, abdominal pain, and icterus improved. Based on the clinical features, normal stool culture, and low C3 level, diagnosis of aHUS was considered and a genetic screen was performed for common mutations associated with aHUS. Results of the genetic screen are shown in Table 2. She was started on immunosuppressants with pulse cyclophosphamide and daily prednisolone. The patient is currently on a tapering dose of prednisolone. She has been doing well for the last 14 months, with no evidence of recurrence to date. The patient presented with the classic triad of HUS. Although the most common cause of HUS in childhood is infection with a Shiga toxin-containing strain of E. coli, such an etiology was unlikely for this patient because of the absence of any suggestive history and a negative stool culture. We therefore considered aHUS, a genetic disorder in which 50-60% of cases are due to mutations in the alternate complement regulatory pathway. These mutations lead to endothelial damage and uncontrolled complement activation . The disease is severe, and associated with poor prognosis and increased mortality. The most common mutation identified is in the gene for CFH (13%), a protein important in down-regulating the alternative complement pathway. Mutations in a variety of other genes for proteins that either regulate or are components of the alternative pathway may also cause aHUS, such as complement factor I (10%), membrane cofactor protein (11%), and thrombomodulin gene (4%) proteins. Importantly, in a minority of patients (5-10%), aHUS may develop due to auto-antibodies to CFH . These antibodies interfere with binding of CFH to C3 convertase C3bBb, resulting in dysregulated complement activation. Anti-CFH-associated aHUS behaves differently clinically than the other aHUS subtypes, with the former frequently occurring in children less than 2 years of age, and the latter being more common in teenagers. Our patient was 9 years old at presentation. Additionally, clinical presentation of anti-CFH-associated aHUS is more aggressive, with a higher frequency of abdominal pain, vomiting, extra-renal complications, seizures, pancreatitis, and hepatitis [3, 4]. Our patient presented with abdominal pain and transaminasemia suggestive of hepatitis. Frequency of relapses is also higher with anti-CFH-associated aHUS when compared to most other types [5, 6]. Plasma therapy has been the cornerstone of aHUS therapy and was essentially the only therapy available until recently. Plasma therapy is effective due to its ability to deliver normal levels of complement factors and, when an exchange is done, to remove mutant complement factors and auto-antibodies, as in this case [7, 8]. It is recommended that plasma therapy be started within 24 hours of suspected diagnosis of aHUS. Efficacy of exchange should be monitored by daily creatinine, platelet count, LDH, and hemoglobin levels. Persistence of hemolysis or lack of improvement in thrombocytopenia after 3-5 days of plasma therapy should be considered no response to therapy, and an indication to stop plasma exchange and start complement inhibitor therapy with eculizumab. It is, however, important to note that patients with aHUS due to membrane cofactor protein mutations are unlikely to respond to plasma therapy because membrane cofactor protein is not a plasma protein. For anti-CFH-associated aHUS, plasma exchange can induce complete remission in 25%, and partial remission in another 50% of the patients . There are reports that concomitant immunosuppression (with steroids, cyclophosphamide, rituximab, mycophenolate, or other drugs) along with plasma exchange can improve results [3, 7, 8]. The major limitation in the management of aHUS is the high recurrence rate and progression to chronic kidney failure in significant number of patients. Although kidney transplants have been tried, their efficacy was limited by the high recurrence rates in the transplanted kidneys. Eculizumab is a humanized monoclonal antibody to C5 that inhibits the terminal phase of complement activation. It has been approved by the American Food and Drug Administration for the treatment of paroxysmal nocturnal hemoglobinuria . Subsequently, a few investigators have used eculizumab successfully in patients with aHUS, especially plasmapheresis-resistant cases [10, 11]. Since eculizumab acts by inhibiting the alternative pathway of complement, patients are at risk for meningococcal infections. Therefore, all patients treated with eculizumab should receive the meningococcal vaccine as well as prophylactic antibiotics for the first 2 weeks after immunization to protect them while their immune response develops. Despite its good efficacy in aHUS, data regarding its utility in anti-CFH-associated aHUS patients is sparse. 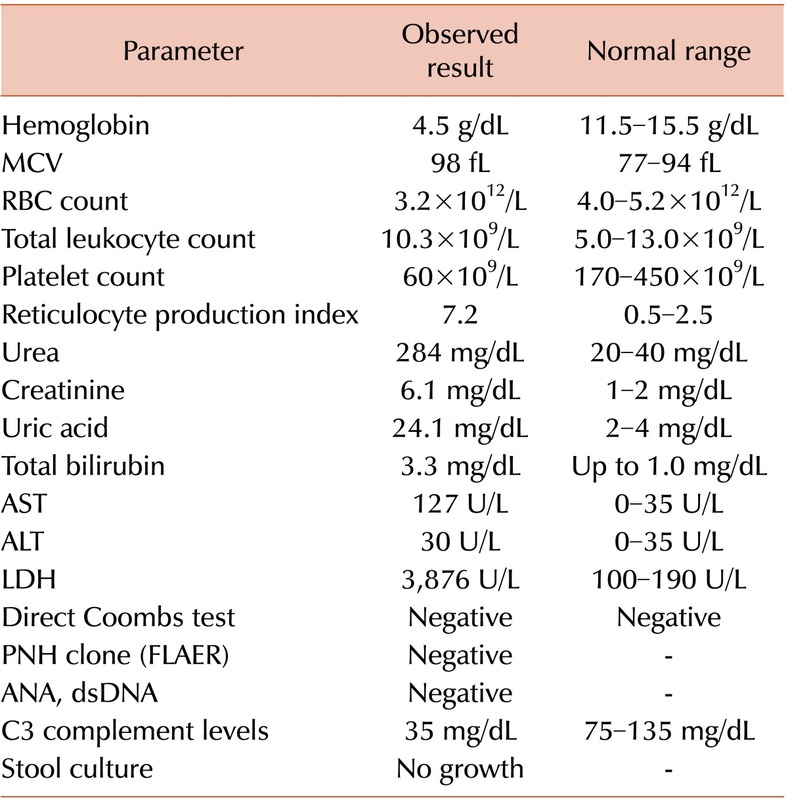 In conclusion, this case highlights several points which clinicians would do well to remember: firstly, HUS must be strongly suspected in any patient who presents with non-specific abdominal or respiratory symptoms along with anemia and thrombocytopenia; secondly, the possibility of thrombotic microangiopathy should be investigated by using a battery of tests including reticulocyte count, LDH, and peripheral smear examination for schistocytes, and, if in doubt, confirmed with renal biopsy; thirdly, complement level should always be assessed before plasma therapy or exchange is initiated; and fourthly, in cases of suspected aHUS, samples should be sent to a reference laboratory to test for mutations. Peripheral smear showing many fragmented cells and spherocytes. Trend of improvement in platelet count (×109/L) and creatinine (mg/dl) after starting daily plasma exchange. Details of laboratory parameters at admission. Abbreviations: AST, aspartate transferase; ALT, alanine transferase; LDH, lactate dehydrogenase; PNH, Paroxysmal nocturnal hemoglobinuria; FLAER, fluorescent aerolysin method; ANA, anti-nuclear antibodies. Results of mutation screen for atypical hemolytic uremic syndrome. Abbreviation: CFH, complement factor H.
Loirat, C, Frémeaux-Bacchi, V. Atypical hemolytic uremic syndrome. Orphanet J Rare Dis, 2011;6;60. Loirat, C, Saland, J, Bitzan, M. Management of hemolytic uremic syndrome. Presse Med, 2012;41;e115-e135. Dragon-Durey, MA, Loirat, C, Cloarec, S, et al. Anti-Factor H autoantibodies associated with atypical hemolytic uremic syndrome. J Am Soc Nephrol, 2005;16;555-563. Garg, AX, Suri, RS, Barrowman, N, et al. Long-term renal prognosis of diarrhea-associated hemolytic uremic syndrome: a systematic review, meta-analysis, and meta-regression. JAMA, 2003;290;1360-1370. Sellier-Leclerc, AL, Fremeaux-Bacchi, V, Dragon-Durey, MA, et al, French Society of Pediatric Nephrology. Differential impact of complement mutations on clinical characteristics in atypical hemolytic uremic syndrome. J Am Soc Nephrol, 2007;18;2392-2400. Caprioli, J, Noris, M, Brioschi, S, et al, International Registry of Recurrent and Familial HUS/TTP. Genetics of HUS: the impact of MCP, CFH, and IF mutations on clinical presentation, response to treatment, and outcome. Blood, 2006;108;1267-1279. Ariceta, G, Besbas, N, Johnson, S, et al, European Paediatric Study Group for HUS. Guideline for the investigation and initial therapy of diarrhea-negative hemolytic uremic syndrome. Pediatr Nephrol, 2009;24;687-696. Taylor, CM, Machin, S, Wigmore, SJ, Goodship, TH, working party from the Renal Association, the British Committee for Standards in Haematology and the British Transplantation Society. Clinical practice guidelines for the management of atypical haemolytic uraemic syndrome in the United Kingdom. Br J Haematol, 2010;148;37-47. Hillmen, P, Young, NS, Schubert, J, et al. The complement inhibitor eculizumab in paroxysmal nocturnal hemoglobinuria. N Engl J Med, 2006;355;1233-1243. Gruppo, RA, Rother, RP. Eculizumab for congenital atypical hemolytic-uremic syndrome. N Engl J Med, 2009;360;544-546. Nürnberger, J, Philipp, T, Witzke, O, et al. Eculizumab for atypical hemolytic-uremic syndrome. N Engl J Med, 2009;360;542-544.